West Indian manatees spend the winter months in the warm waters of the Caribbean and Gulf Coast, including Everglades and Biscayne National Parks, and migrate to cooler waters in the summer. Manatees can be found in sallow, slow-moving rivers, estuaries, saltwater bays, canals and coastal areas. The manatee has a large, seal-shaped body with paired flippers and a round paddle-shaped tail. They are primarily gray in color, with wrinkled skin covered with hairs and sometimes algae or barnacles. Often referred to as “sea cows”, manatees are primarily herbivores, spending up to eight hours each day grazing on aquatic plants like seagrass and occasionally feeding on fish. A history of hunting and low reproductive rates challenged the West Indian manatees’ natural repopulation. The manatees were further stressed when increasing boat traffic contributed to fatal collisions and coastal development led to habitat degradation. This combination of natural and human factors ultimately led the species to the brink of extinction and manatees were listed as endangered in 1967 under the Endangered Species Conservation Act, the precursor to the Endangered Species Act of 1973. Conservation efforts by a wide variety of public and private organizations - local, state and international - aided in the ongoing recovery of the West Indian manatee. Protected under the Marine Mammal Protection Act, it is now illegal to hunt manatees in the United States and the designation of critical habitat in 1976 helped to reduce the threat of habitat destruction and fragmentation. 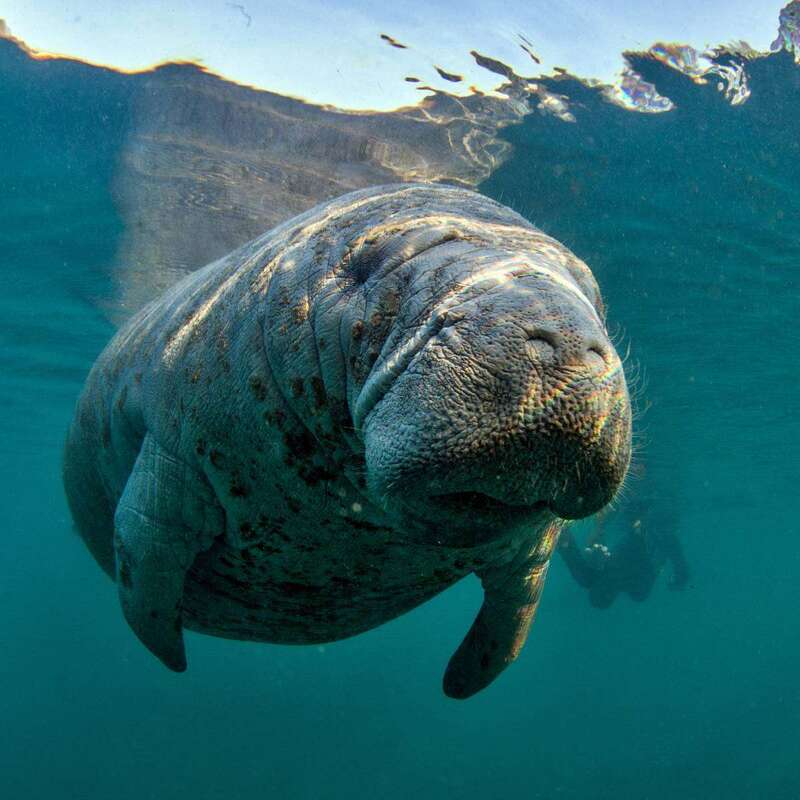 In 1989, Florida developed a Manatee Recovery Plan, identifying 13 key counties where the species could benefit from stricter watercraft regulations to reduce the likelihood of collisions. By 2017, the population of West Indian manatees had recovered enough to be downlisted threatened. Today the range-wide population is estimated to have more than 13,000 members with more than 6,500 in the southeastern United States and Puerto Rico. The Florida population has increased from only 1,270 members in 1991 to more than 6,300 in 2017. While no longer in immediate danger of extinction, manatees still face significant challenges. Accidental collisions with boats continue to be a primary cause of death for the species and the Red Tide, a toxic algal bloom, increased the death toll in 2018 off the Florida coast. National parks, particularly in Florida, help ensure the continued success of the manatees by providing safe havens subject to environmental regulations that protect wildlife and water quality and enforcing laws that restrict boating activity to minimize watercraft-related manatee fatalities. Everglades National Park, for example, tags and monitors manatees, which enables park biologists to track the park’s manatee population and to identify and address warning signs of stress before the park’s manatee population can experience significant decline.